To The Person Sitting In Darkness. Twain, Mark. (Samuel L. Clemens). New York: Anti-Imperialist League, 1901. 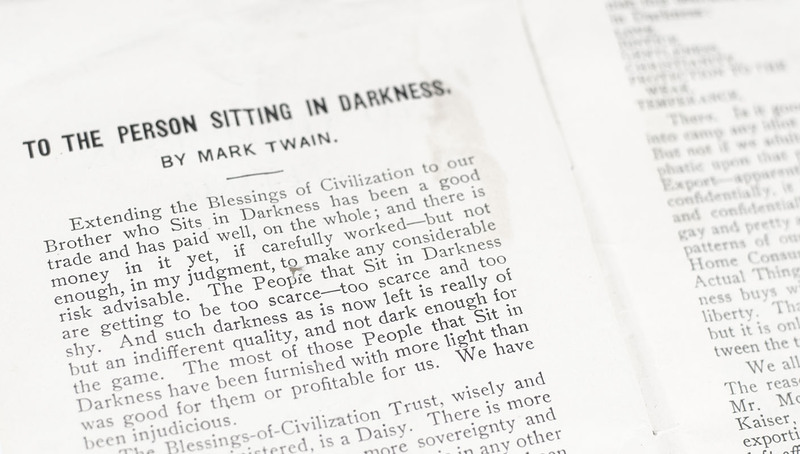 First edition of Twain’s satiric essay first published in the North American Review in February 1901. Small octavo, original wrappers as issued. Ownership signature to the front panel. In very good condition. Housed in a custom cloth clamshell box. Rare. Mark Twain was 'an outspoken critic of American involvement in the Philippines and China', and "one of the mammoth figures in anti-imperialism, and certainly the foremost anti-imperialist literary figure", having become in January 1901 a vice president of the Anti-Imperialist League of New York. He published this satiric essay in an effort to express his anti-imperialist views pertaining to the Boxer Uprising and its aftermath, the Boer War, and the Philippine–American War (Harris, 142; Emerson, 257). The Tragedy of Pudd’nhead Wilson. And the Comedy, Those Extraordinary Twins. Hartford: American Publishing Company, 1894. First edition, first state of Twain’s story about two boys. Octavo, original brown cloth, elaborate gilt titles and tooling to the spine and front panel, frontispiece engraved photographic portrait of Twain with facsimile signature, with marginal illustrations to nearly every page. In near fine condition. Boston: James R. Osgood and Company, 1883. First edition, first state of this provocative portrait of the great Mississippi River with tailpiece of Twain in flames on p. 441 and “The St. Louis Hotel” caption on p. 443. Octavo, original brown cloth, gilt titles and tooling the spine and front panel. In near fine condition with light rubbing to the extremities. An exceptional example. King Leopold’s Soliloquy: A Defense of His Congo Rule. 1905: The P. R. Warren Co, Boston, Massachusetts. New York: Harper & Brothers Publishers, 1881. 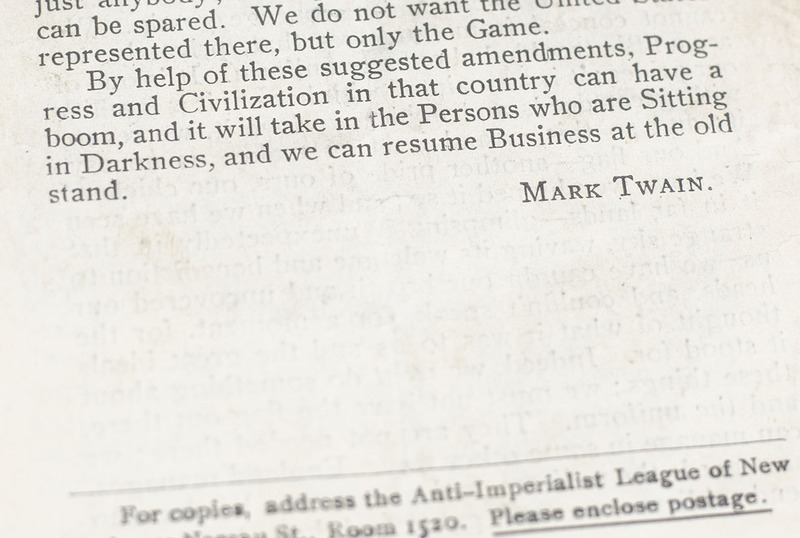 The Author’s National Edition of the writings of Mark Twain. Octavo, 25 volumes, bound in three quarters morocco over marbled boards, gilt titles and tooling to the spine, morocco spine labels, top edge gilt, engraved frontispiece to each volume, illustrated. In fine condition. Mark Twain’s (Burlesque) Autobiography and First Romance. New York: Sheldon & Company, 1871. First edition of this collection of Twain’s short stories with the title page without advertisement on verso (BAL 3326). Small octavo, original blind-stamped cloth, gilt titles to the front panel, illustrated. In near fine condition. Hartford, Connecticut: American Publishing Company, 1872. 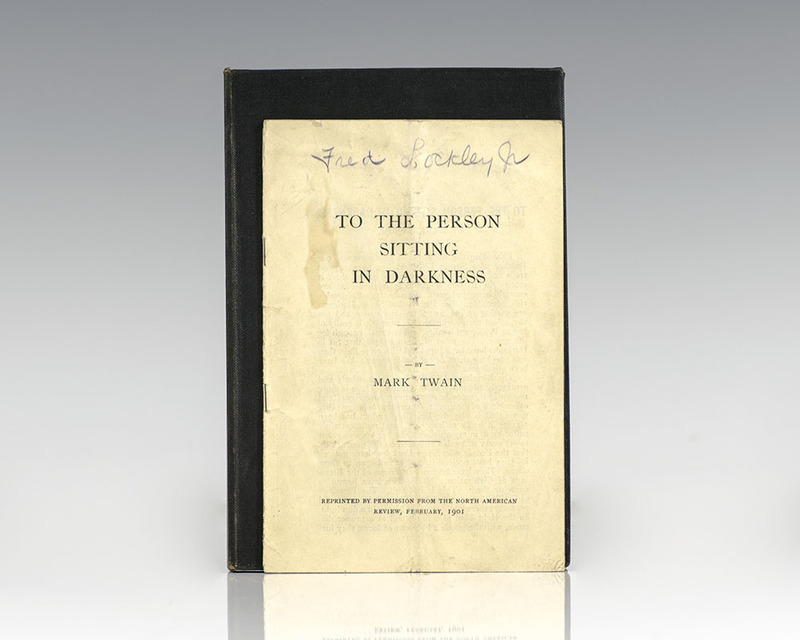 First edition, first state of Twain’s first semi-autobiographical work of travel literature, essentially a prequel to The Innocents Abroad, with the word “his” on line 21 and the advert present on page 592 (BAL 3337). Octavo, bound in the original publishers three quarters morocco, gilt titles to the spine, raised bands, all edges marbled, marbled endpapers, engraved frontispiece with tissue guard, fully illustrated by eminent artists. In near fine condition.